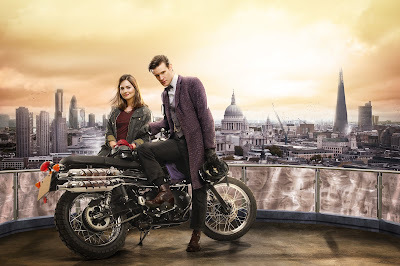 Today the BBC have release two new promotional pictures for The Bells Of Saint John. It’s a bit more of a serene image compared to the last ones! 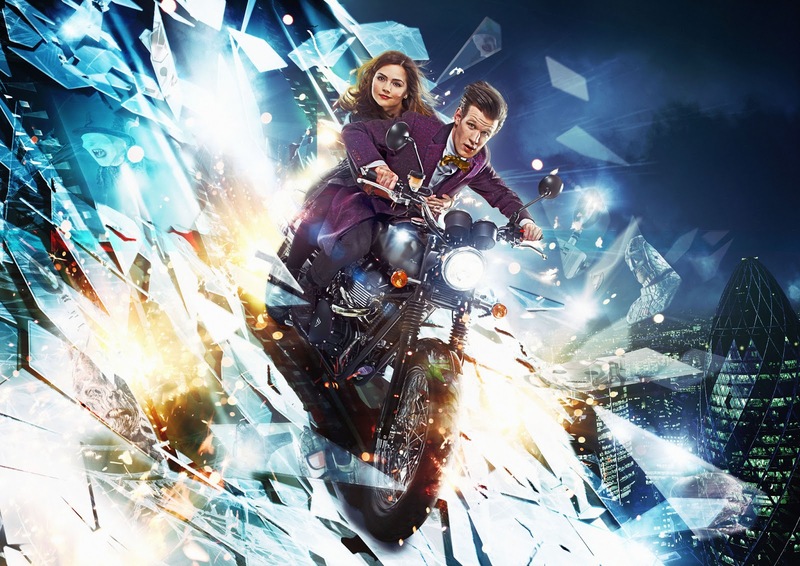 As ever it shows some nice details of The Doctor’s new costume, giving us a little flash of the lining inside the Frock Coat. Thank heavens, given the cost of the cashmere fabric the bulk of the coat is made from, this lining looks to be a nice and simple plain purple colour. I’d love to track down those black leather gloves. 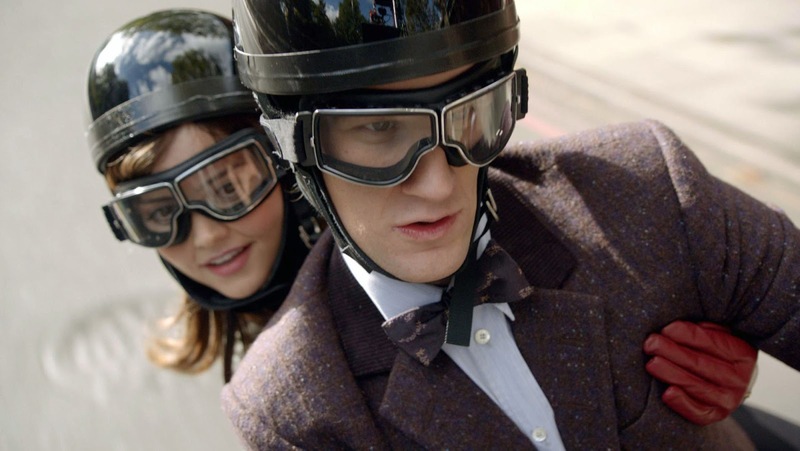 Not necessarily for cosplay, but it would be cool to wear the same gloves as The Doctor. 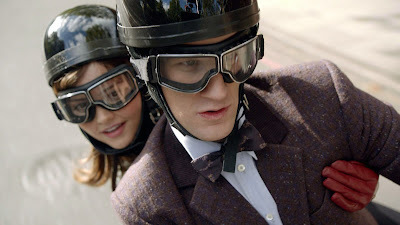 Personally I’m not convinced we’ll find a 100% match for the crash helmets. 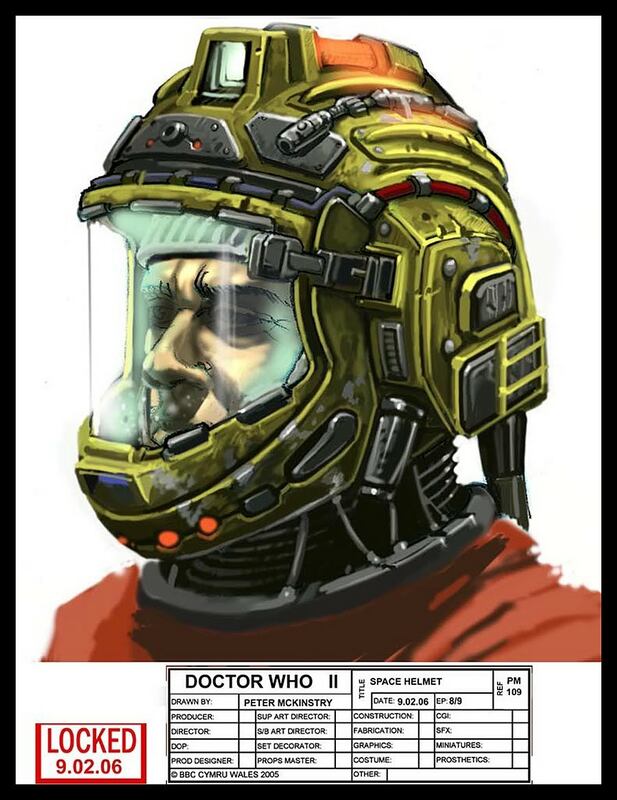 To me they look to be adapted from some form of basic helmet. If you look at the picture below, you can see there is a ring of gaffer tape around the base of the dome! With the increasing popularity of Doctor Who in the US, where is now seems to be seeping into the mainstream, Entertainment Weekly has put the launch of the new series on its cover - not once, but twice! 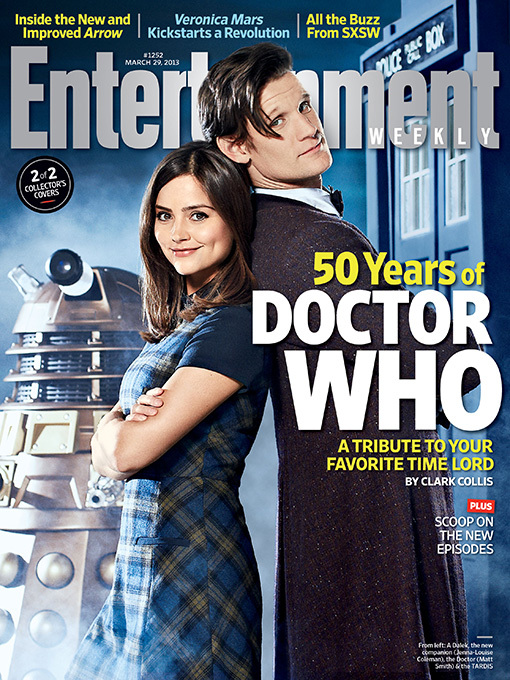 Call me cynical, but it seems to be a common thing these days to produce an alternative cover to sell more copies of a magazine, especially when a popular film or tv show is being promoted, backed by a collector-based fan base. The photos were taken in London by photographer Ian Derry. He takes a lot of shots for entertainment magazines as well as blue chip magazine advertising. 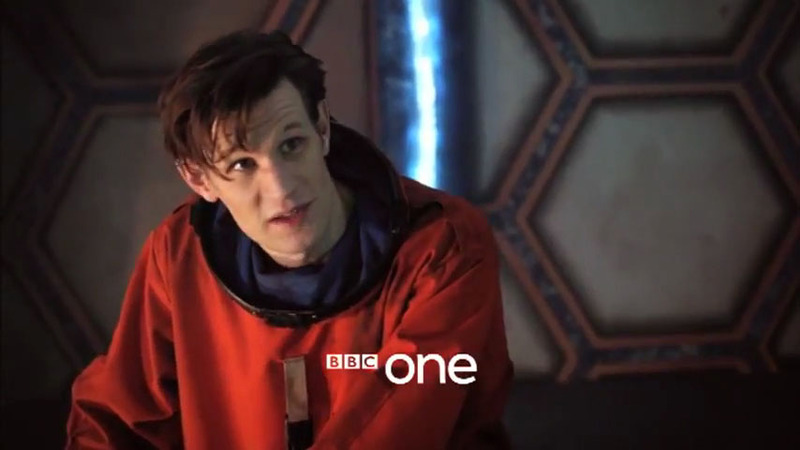 So, it looks like the Eleventh Doctor is raiding his wardrobe, and digging out his old Sanctuary Base Space Suit. 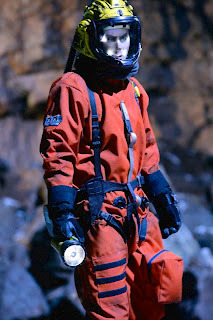 For those not familiar with the suit, it first appeared in series two’s episodes The Impossible Planet and The Satan Pit as part of the equipment at Sanctuary Base Six; the idea of a space suit returned (abet remade and a slightly different colour) in 42; before making a final appearance in The Waters Of Mars. 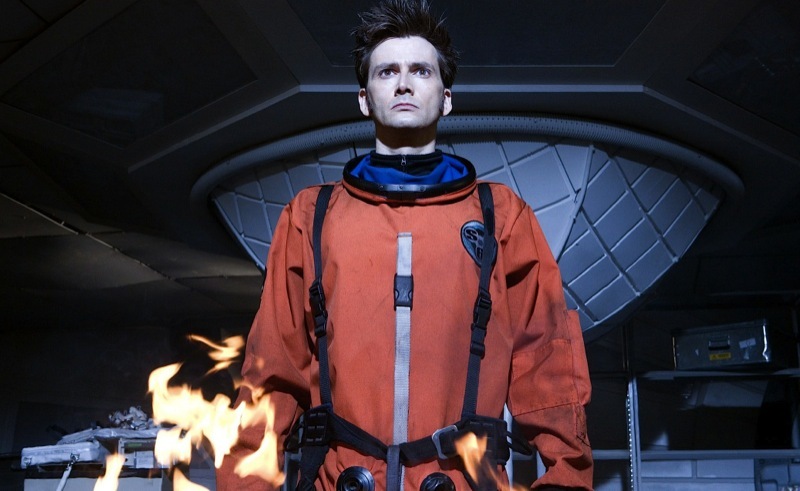 The suit may look to be custom designed, but Doctor Who is made on a limited budget and if anything can be sourced as pre-existing pieces, it will be – and this suit is a prime example. 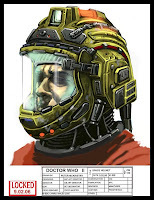 All of the accessories such as gloves, boots, harness and base of the helmet were all widely available at the time of production for a reasonable price. 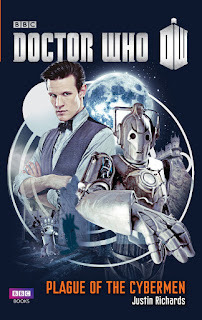 Annoyingly they are now pretty much discontinued, but are not out of the reach of the more persistent Doctor Who fan who is willing to track them down on eBay or as remaindered stock. 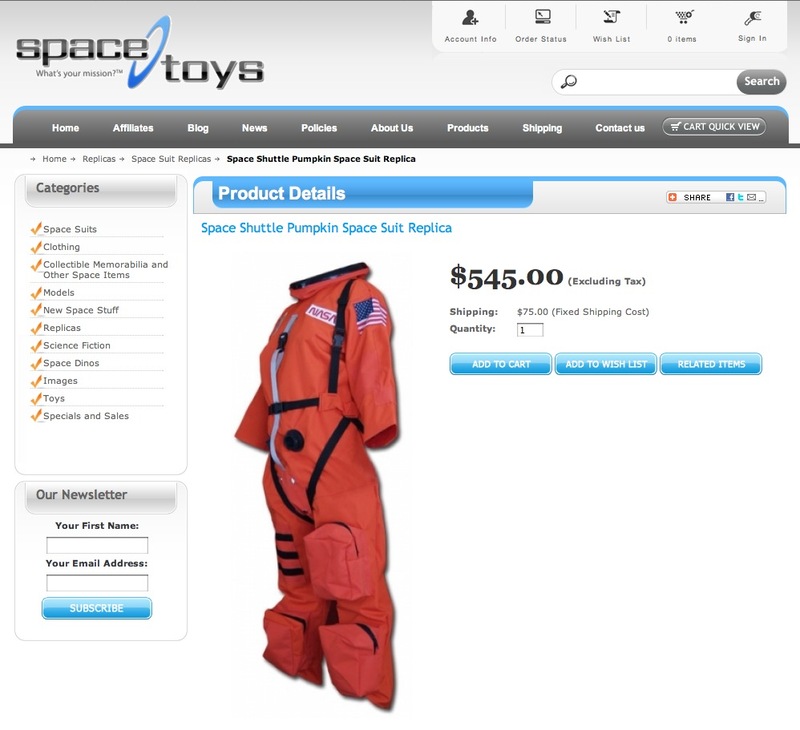 The orange suit itself came from a company in the US who make replica space exploration suits and equipment. 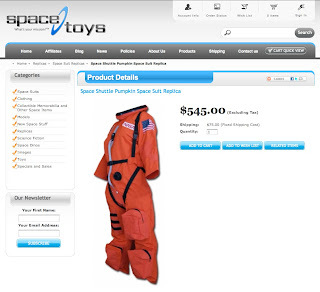 Based closely on the suits worn by the Space Shuttle pilots, they are still available to this day, and costs $545 for a standard version, or $875 for a deluxe version. As I have already mentioned, the rest of the items are now discontinued, but here is a quick guide to what to look for. 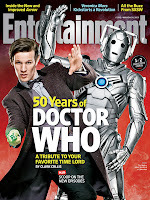 Eleventh Doctor to wear Tennant Suit! Bet the headline got your attention! With less than two weeks to go before the latest episodes start screening, a new trailer has been released, showing some highlights of what we can expect. At one point we get a glimpse of Matt Smith wearing a suit previously worn by David Tennant during his era. 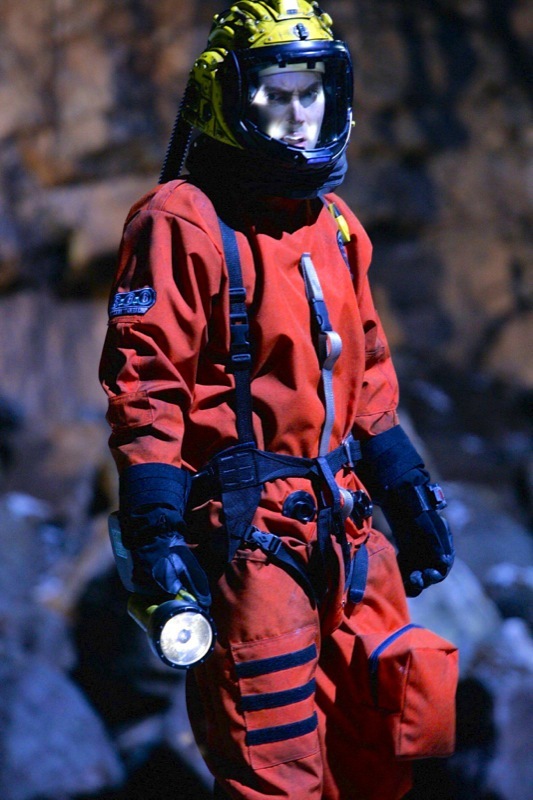 It goes without saying we are not talking about the iconic brown pinstriped suit - but the Sanctuary Base orange space suit first seen in The Impossible Planet. 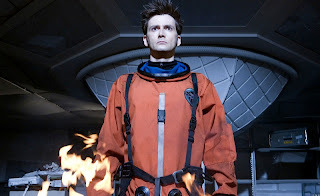 I’ve covered background information over on my Tennant Suit blog, but watch out soon for a summary here. 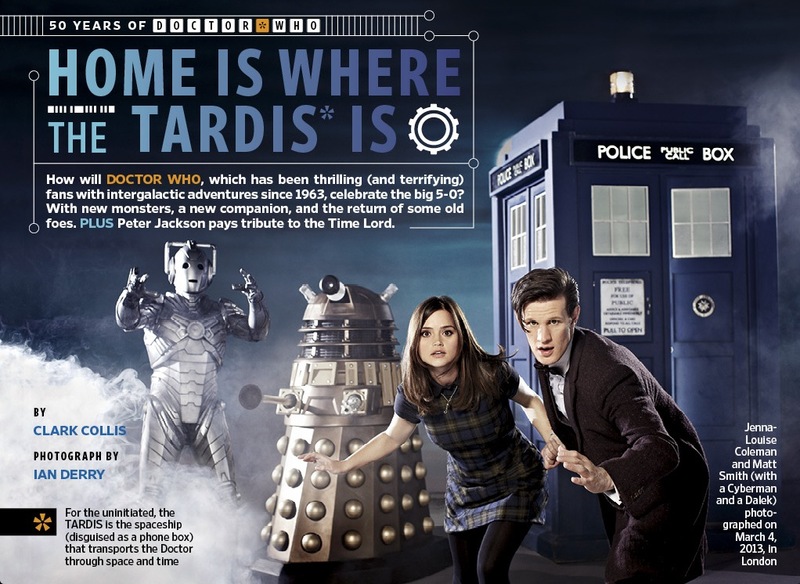 The new series of Doctor Who is only days away, and there has been another collection of publicity still from the BBC press office. 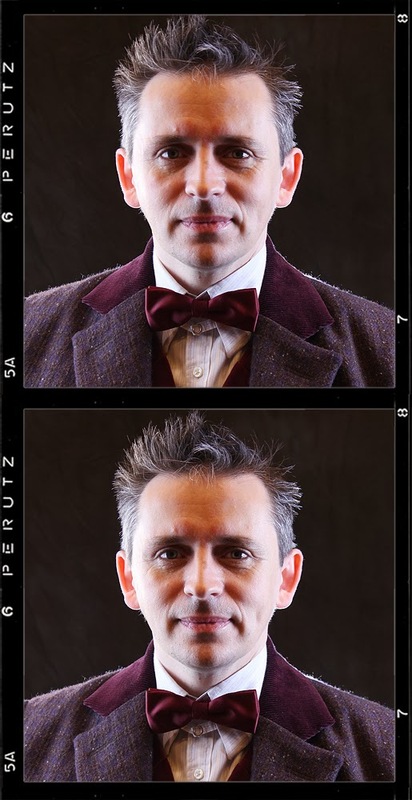 Included in this batch are character portraits, including The Doctor in all his new finery. The shots released give the best view yet of the new look. The bow tie is a moody black silk number, with a subtle gold floral design. His shirt is a pale blue striped dress shirt, with french cuffs and a plain (un-tabbed) collar. 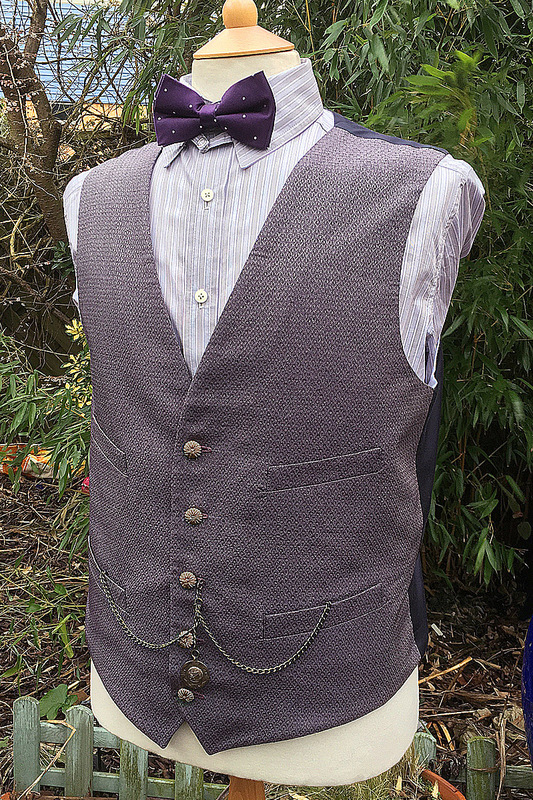 We can see some detail now of the grey waistcoat, which has a woven fish-scale effect and silk buttons. it’s finished off with a double Albert pocket watch fob chain. 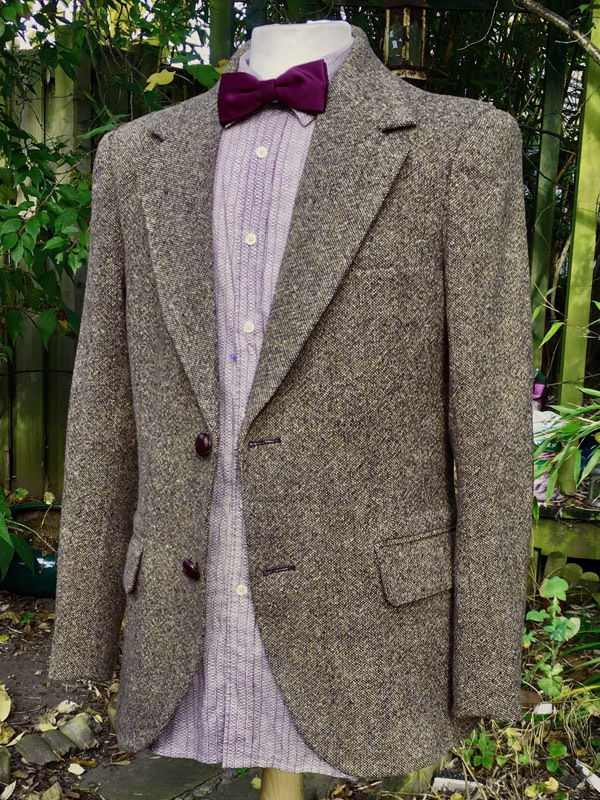 We can now get a decent look at his purple cashmere frock coat with corduroy collar and horn-button cuffs. 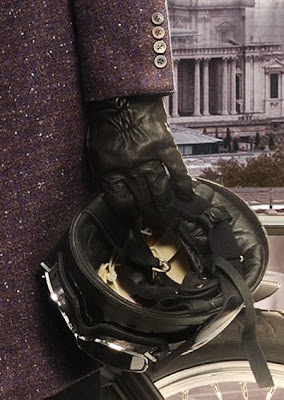 We can now very clearly see his two-tone purple and brown boots, emblazoned with an intricate hand-punched design. He still seems to be clinging onto those old G-Star RAW black jeans though. The second half of Series Seven is less than a month away, and the BBC publicity machine has creaked into action and released the first images of Matt and Louise this year. 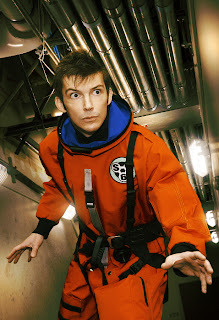 A lot has been written about the sneak peeks at the monsters awaiting us, but with the eyes I have my focus is on the costume Matt is wearing! And OMG - WHAT is he wearing??!! Now I like these photoshopped images as much as the next guy, and having worked in advertising for 20 years before becoming a tailor I have more than the average idea of what goes into something like this. But this has been photoshopped to within two steps of hell! Where has that GOLD bow tie come from? And having found the original cashmere fabric, I can tell you it is NOT that shade of plum and the woven grid on it is most definitely not that shade of purple. You can see his new boots, but again the colour combinations there are somewhat twisted from the real thing. A similar distortion can be seen on the covers of the latest tie-in novels to be released. 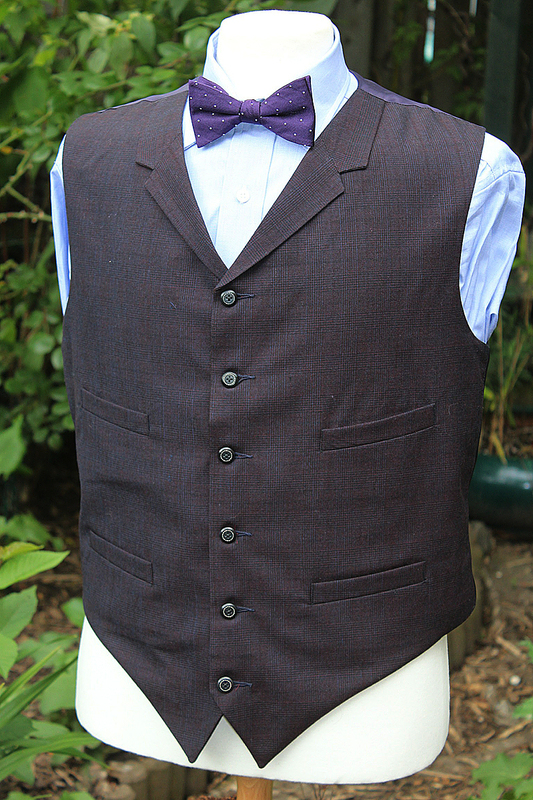 Someone wrote to me recently asking about the new purple waistcoat. 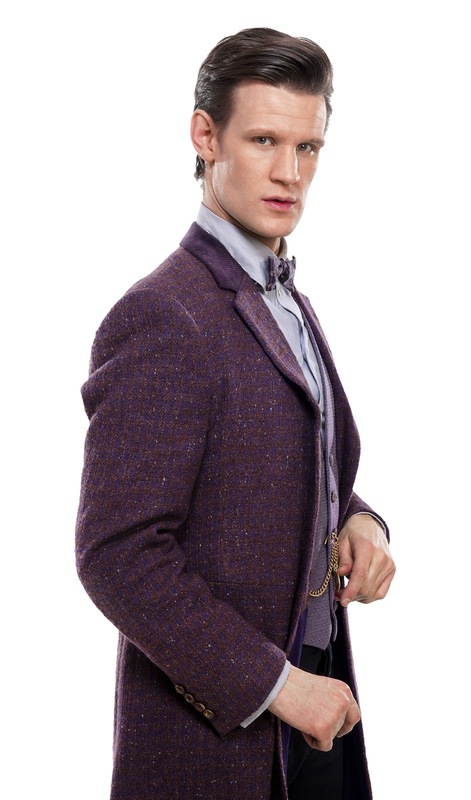 What purple waistcoat I wondered? 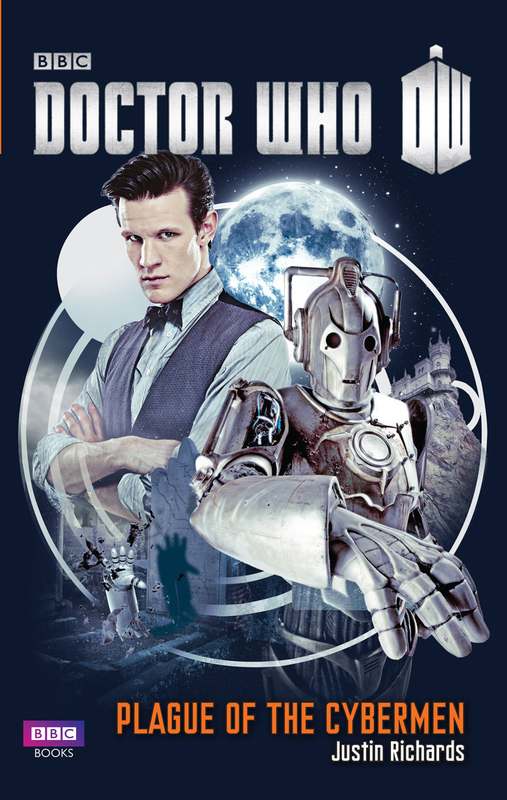 I then realised they meant the cover of Plague Of The Cybermen where his new GREY waistcoat has been retouched to look a mauve colour. 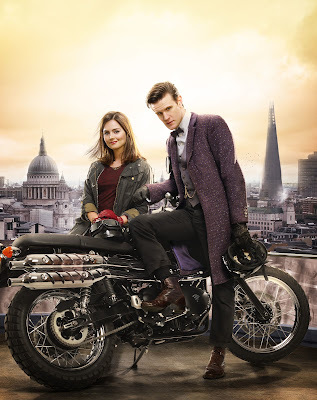 Just one tip - if you’re assembling a cosplay for series seven, these promo images are NOT the thing to use for reference for colour! This year Scott Sebring has done me some great photos. 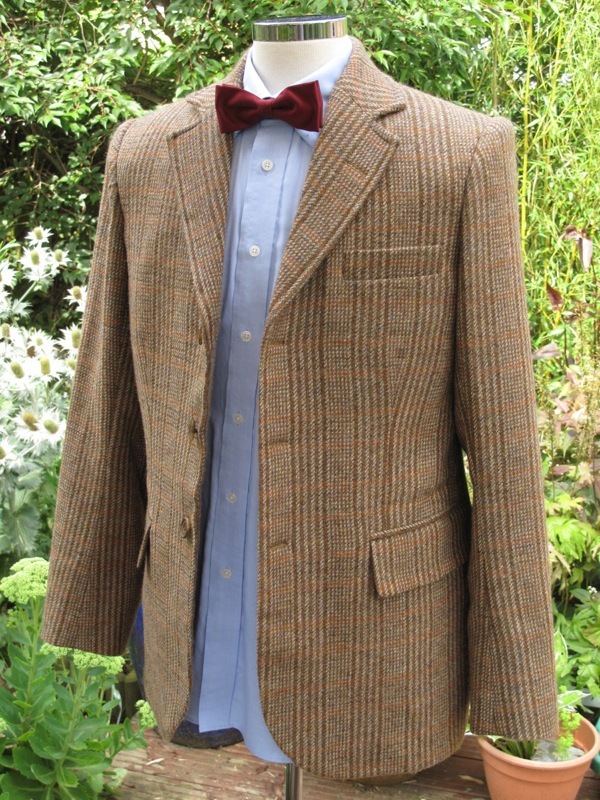 As well as taking a group shot with three of my Ultimate Six Frock Coats, he also did me a nice full length shot of me in my new Cashmere Frock Coat. 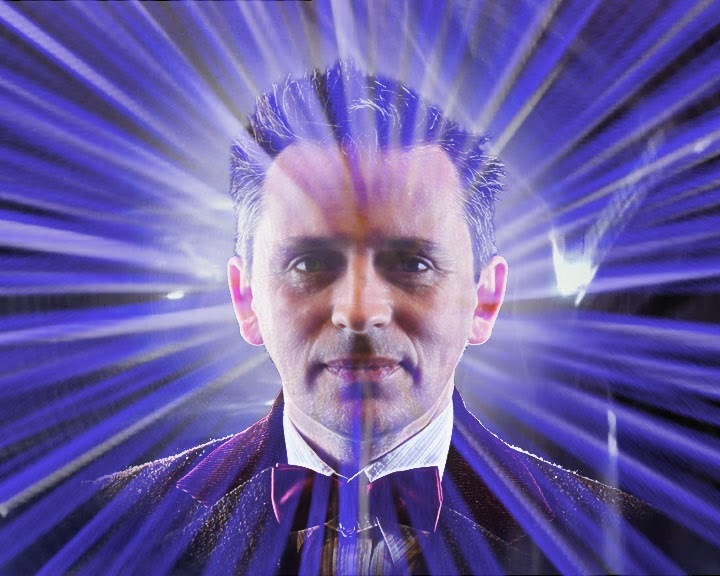 While we were about it, Scott had the brilliant idea of doing a head-shot a la the classic Doctor Who opening credits! Scott positioned a lamp behind me to give that highlight halo around the edge of my head, and placed some other lights to catch the side of my face. We did a couple of takes, and then gave the chance for a number of other cosplayers to step in to get their shots too as the camera was perfectly set for just the right shot. Then it was just down to having some fun in Photoshop to recreate the look and feel of Tom’s iconic appearance from 1975. 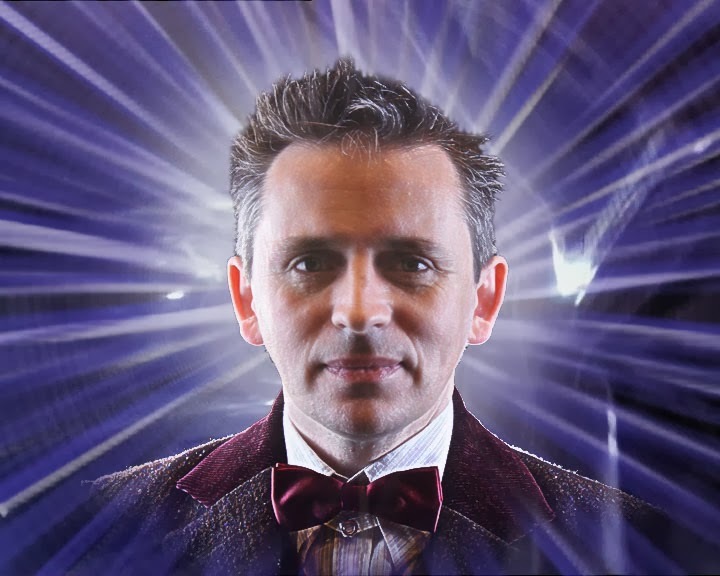 My first go was okay, but I think the flare across the face is a bit too intrusive. I had another go, toning it back quite a bit. I think I like this better. This will be my new avatar! Series Seven promo images - Photoshop disasters?